Of course a floating city must be more than just a couple boats anchored in deep water. You need power, water, internet, shopping and community, and a dozen other necessities and niceties. Enter the Isle concept. The isle is our ultimate product; you can literally buy an entire floating isle if you like, tailored to the size and purpose of your expected community. This is our most ambitious product, requiring a large number of integrated systems to provide community necessities, meaning that questions of power generation, waste-treatment, water production, and the like are taken into account and provided. 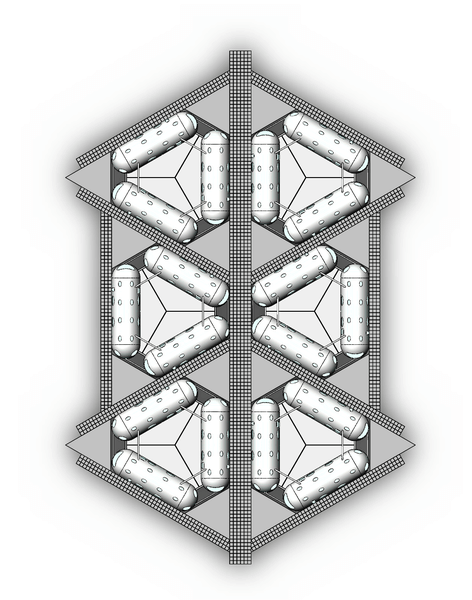 We will produce modular solar-panel units that double as commercial and outdoor space. These will be supported by batter installations to provide flexible power variance. We are taking the modular concept to its ultimate level and intend to offer entire working isle units. Expansion of the isle can be done via modular addition over time. Add more power, more living space, more dockways, more marina space, etc., etc. We will offer a constellation of support-structures isles will require, including solutions for marina parking, commercial space, and the like. Any application that needs significantly more space and support than a residential or commercial structure, or when you need to build an isle from scratch in a new part of the world, begins to require the isle. What minimum number of people it will make sense to purchase an entire isle for is still something we are working on determining, but we think that a minimum of 50 people is reasonable. 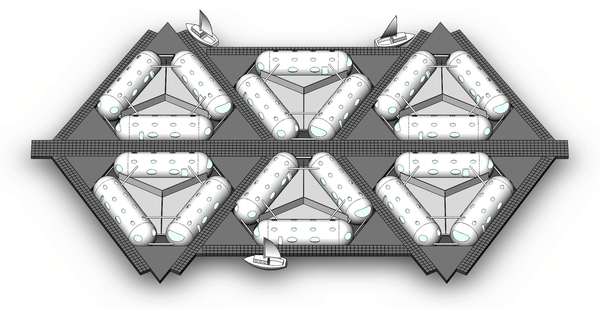 The isle is designed to work with our other floathouse configurations, but the difference between owning a bunch of floathouses and having an actual floating city is the necessary supporting structures and services that a city offers that a non-city does not. On this page are several images showing possible isle neighborhood building blocks, some showing concepts for how to structure entire neighborhoods together. The dockways shown are also constructed of hollow, seawater-proof reinforced geopolymer concrete. At this point we enter a realm of design which is so broad and variable that it is difficult to say in what ways people may start using these products in the real world. We offer suggested configurations, but expect our customers to use them in ways we cannot currently anticipate when it comes to structuring an entire isle. We will work together with our clients to customize a solution to their isle needs. Shown above is what we call an ‘isle neighborhood,’ designed to house 18-90 people. We plan to organize the isles by separate neighborhoods of under 150 people at a time, which is large enough to create community, yet small enough that everyone can still know all their neighbors. An isle needs several things: breakwater protection, sections designed for specific purposes such as residential and commercial, connecting and positioning tendons to hold the isle in the desired configuration, and provision for various forms of travel, such as the dockways for foot-traffic, or leaving open-water space between isle neighborhoods to be used as a ‘whale-road’ meaning open water for skiff traffic. We will produce and offer for sale floating breakwaters, dockways, and positioning-pylons to structure the isle, and the like. The most difficult aspect of the isle from a production point of view is how open-ended it is in terms of structure and configuration. To address this, we plan to build modular units that fit together nicely using the concept of ISO-216 proportions. This would allow the city to grow organically without major growing pains. We further plan to modularize required services into logical blocks. If we can build an isle that works well for say 100 people, then 10 such structures should be able to easily serve 1,000. But at some point, it makes sense to reconfigure for larger numbers, and this must be taken into account as well. For example, one may plan differently how to provide power for 100 people than to provide power to 1000. Q: How is the isle anchored or kept in place? A: We have few options in mind currently. One, if appropriate for the area, you can use a typical anchor or a vacuum anchor (in muddy soil). Another option is GPS-based active station-keeping, which uses special boats and engines to keep a floating structure in one place or to move it around as desired, without an anchor to the sea-floor. 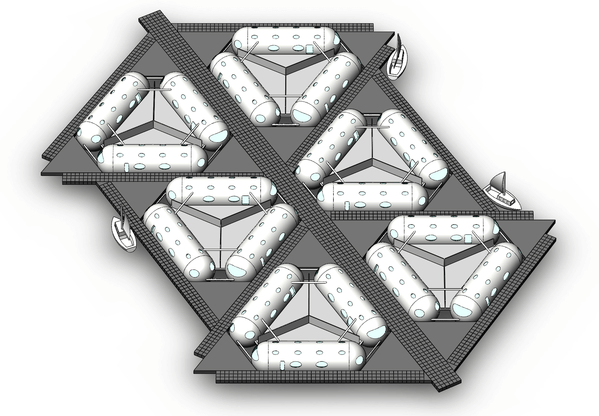 Small isles will be able to use anchors or multiple anchors, but the larger cities that are possible to be build will likely tend towards active station-keeping. Q: How can people earn a living on an isle? A: Our first isle is planned as a visa-haven, for entrepreneurs and will be located outside San Francisco, in international waters. After it is established and the first residents make themselves at home, some percentage of them will develop successful companies and require employees. We expect this type of job, software development, to be one of the earliest positions. Once there are enough people earning a good living serving software to the world, there will naturally arise opportunities to provide services to those people, such as diners, stores, coffee-houses, and entertainment of all sorts. By this means, a city is founded, and a cultural-identity can take root.